Ancestry.com. Public Member Trees [database on-line]. Provo, UT, USA: Ancestry.com Operations, Inc., 2006. Original data: Family trees submitted by Ancestry members. 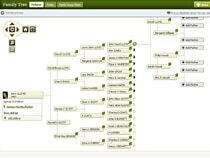 This database contains family trees submitted to Ancestry by users who have indicated that their tree can be viewed by all Ancestry subscribers. These trees can change over time as users edit, remove, or otherwise modify the data in their trees. You can contact the owner of the tree to get more information. Note: These trees are voluntarily submitted by Ancestry users like you. We take all tree data "as is" and cannot guarantee the completeness, accuracy, or timeliness of the information contained in this database. We regret we cannot assist you in your personal research or prevent duplication of data. Our goal is to provide this user-contributed data to aid you in finding and/or correcting your family information. In this collection you'll find information from Ancestry members' public family trees. If you find a tree associated with your family you can contact the owner through Member Connect. See a tree for the family of John F. Kennedy. This database contains family trees submitted to Ancestry by users who have indicated that their tree can only be viewed by Ancestry members to whom they have granted permission to see their tree. These trees can change over time as users edit, remove, or otherwise modify the data in their trees. If you would like to view one of these trees in its entirety, you can contact the owner of the tree to request permission to see the tree. This database contains photos submitted to Ancestry family trees by users who have indicated that their tree can be viewed by all Ancestry members. These photos can change over time as users edit, remove, or otherwise modify the data in their trees. You can contact the owner of the tree to get more information.